Pierce County and surrounding areas. Leadership Team and the history of Tacoma Older LGBT. If you are an older (50+) LGBT adult, as you look at our website, check out our social Events page, we have a main events page and then specific pages for the men, the women, the Transgender community and the whole LGBT community. We have a section for﻿ "Special Events" ﻿too. Be sure to check all events some are open to the entire LGBT community even though they may be geared toward a specific gender. Join us for the good times! If you are a health care provider or an organization that serves aging adults, you will want to check out our Training page. We would love the opportunity to meet with you and discuss how we could help increase you and your staff's cultural fluency and competency on aging LGBT adults. 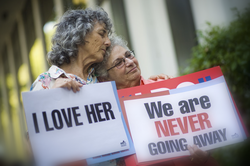 If you are one of our individual supporters and want to get the latest on Tacoma Older LGBT,join our Email List for the latest announcements and update or if you want to help support us with tax free donations check out our Support page. Community Partners are what helps to make us great. Working together to support each others missions and visions serves to strengthen our entire community.